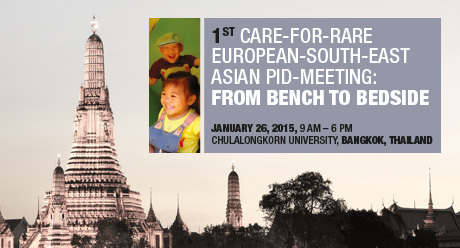 IPOPI in collaboration with the Care-for-Rare Foundation, co-organised the “First Care-for-Rare European-South East Asian PID Meeting – from Bench to Bedside” in Bangkok, Thailand on 26 January 2015. The meeting was endorsed by Thailand’s Minister for Health, His Excellency Mr. Rajata Rajatanavin, and attended by over 100 PID doctors and stakeholders. This successful and historical event brought for the first time together PID experts from 6 countries in South East Asia including Indonesia, Malaysia, the Philippines, Singapore, Thailand and Vietnam. 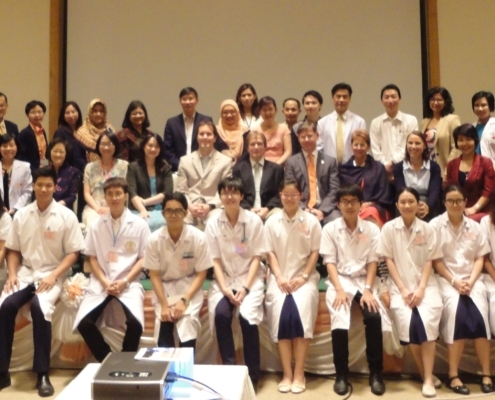 The meeting which was held in Chulalongkorn University Hospital included scientific lectures by Prof Christoph Klein (Founder of the Care-for-Rare Foundation) and Prof Martin Van Hagen (IPOPI Medical Advisory Panel). Additional lectures by experts from Singapore, Malaysia, Vietnam and Thailand also featured on the scientific programme. A presentation on “the Importance of Stakeholders Collaboration” by Johan Prévot, IPOPI’s Executive Director, kick started the afternoon session and was followed by a lively Round Table discussion on “Access to diagnosis and PID care in South East Asia”. The Round Table was pivotal in identifying key priorities for the region and a “PIDs in South East Asia” Call for Action was launched. Importantly, the meeting also marked the birth of a South East Asian Network of PID experts bringing together PID doctors from the region. IPOPI was pleased to be able to support this meeting under its Bob LeBien Asian programme and looks forward to further collaboration with the new network. The support of doctors in South East Asia is key to continue developing new patient organisations in the region and IPOPI is planning additional events in the region in 2015. Undoubtedly this was a very important moment for the PID community in South East Asia which will contribute to further develop PID patients’ diagnosis and care. IPOPI would like to thank Dr Narissara Suratannon whose assistance and dedication were key to the meeting’s success. IPOPI would also like to thank the Care-for-Rare Foundation for the excellent and fruitful collaboration. 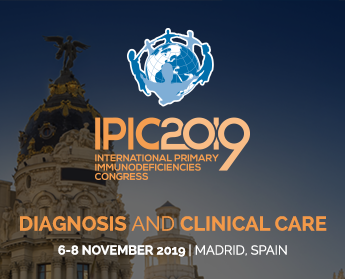 When to give IG replacement therapy, PID and respiratory disorders, PID and... IPOPI patient testimonials videos are here!